Researchers considering levels and trends in the resources available to the middle class traditionally measure the pre-tax cash income of either tax units or households. In this paper, we demonstrate that this choice carries significant implications for assessing income trends. Focusing on tax units rather than households greatly reduces measured growth in middle class income. Furthermore, excluding the effect of taxes and the value of in-kind benefits further reduces observed improvements in the resources of the middle class. Finally, we show how these distinctions change the observed distribution of benefits from the tax exclusion of employer provided health insurance. 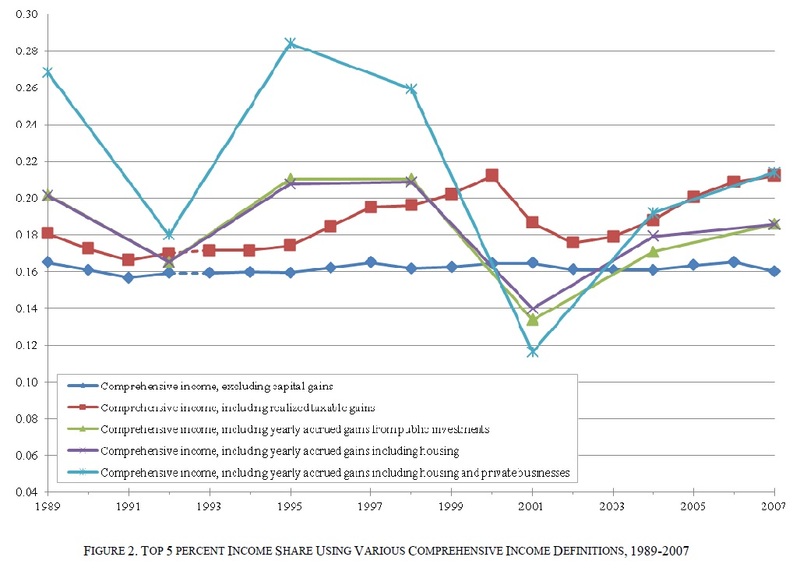 Recent research on United States levels and trends in income inequality vary substantially in how they measure income. Piketty and Saez (2003) examine market income of tax units based on IRS tax return data, DeNavas-Walt, Proctor, and Smith (2012) and most CPS-based research uses pre-tax, post-transfer cash income of households, while the CBO (2012) uses both data sets and focuses on household size-adjusted comprehensive income of persons, including taxable realized capital gains. This paper provides a crosswalk of income growth across these common income measures using a unified data set. It then uses a more consistent Haig-Simons income definition approach to comprehensive income by incorporating yearly-accrued capital gains to measure yearly changes in wealth rather than focusing solely on the realized taxable capital gains that appear in IRS tax return data. Doing so dramatically reduces the observed growth in income inequality across the distribution, but most especially the rise in top-end income since 1989.